It’s been an impeccable start to 2019 for Genie Bouchard. First, a quarter-final finish in singles in Auckland. Then two days later she claims the doubles title – the first of her career. And today? The 24 year old from Montreal blasts past former World No. 14 Peng Shuai in a display of vintage aggressive tennis. Bouchard raced off to an early double-break lead against the Chinese wild card in the first set, and didn’t look back. Despite giving Peng a look at a break point in the sixth game, she was able to save it with impressive serving and eventually closed out the set. The second set was more of the same and followed an impressively similar script. Absolutely dominant from the baseline off both wings, Bouchard took advantage of Peng’s tentativeness and struck winner after winner to earn yet another insurmountable lead. After 59 minutes, Bouchard claimed a the win 6-2, 6-1 to reach the second round for the sixth time in as many years. The victory means that up next for the Canadian is none other than Serena Williams, who earlier in the day cruised past fellow WTA mom Tatjana Maria 6-0, 6-2. The meeting will be their first since the WTA Finals back in 2014 and their third overall in what will be a true test of both of their forms. Later in the day, Denis Shapovalov and Bianca Andreescu helped Canada go three-for-three in singles action. After going winless in his first tournament of the year at Auckland’s ASB Classic, Shapovalov came into the 2019 Australian Open with a few question marks. Would an intense off-season in Florida pay off? Was the three-set opening-round loss in Auckland just a blip in the radar? Well, his dominant 6-2, 6-3, 7-6(3) win over Pablo Andujar should have answered any questions. As has become customary, Shapovalov came sprinting out of the gates, jumping ahead with an early break of serve and never looking back over the first two sets. His lefty serve and electric ground strokes were doing their usual damage, but the 19-year-old remained patient in longer points, opting to build out a winner or force an error rather than going for broke. Following Genie’s explosive straight-sets win on 1573 Arena, Denis Shapovalov is on fire himself, moving ahead 6-2, 6-3 against Pablo Andujar. Serving for the match at 5-4, the Shapovalov serve would finally waver and his seemingly impenetrably confidence would crack, handing over a first break of the his serve to Andujar. The lapse was ultimately only temporary, as he raced to a 6-2 lead in the third-set tiebreak, eventually sealing victory with a final forehand winner – his 51st of the match. Shapovalov will face Taro Daniel in the second round. At a nearly identical finish time to her teenaged compatriot, Bianca Andreescu edged out 16-year-old Whitney Osuigwe in a gritty 7-6(1), 6-7(0), 6-3 decision. Andreescu and Osuigwe, who would have been familiar with each other from their junior days together, put on a brilliant display of the future of women’s tennis in front of a packed Court 15 crowd. 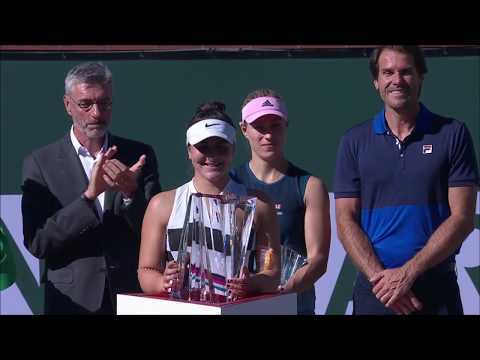 In a matchup of the Canadian’s court craft and power versus the American’s dogged defence and nimble movement, it was power that won in the end – 40 winners from Andreescu was twice the amount of her opponent and was the difference as both hit similar numbers of unforced errors. Fitness became the Mississauga-native’s opponent just as much as the player across the net in the end, as a visit from the trainer was needed after breaking the Osuigwe serve in the fifth game of the final set. After a back massage, Bianca buckled down and built her points, forcing a nervous Osuigwe onto the back foot. Finally, after nearly three hours of tennis, Andreescu emerged victorious. Bianca Andreescu claims a nearly-three-hour #AusOpen thriller, overcoming the USA’s Whitney Osuigwe 7-6(1), 6-7(0), 6-3. Up next for the Canadian teenager is No. 13 seed Anatasija Sevastova.